Die heiss geliebte Diana+ von Lomographie ist tatsächlich geschrumpft. Unglaublich leicht und handlich gibt es nun die kleine Schwester - Diana Mini - jetzt mit Standardfilm. Also, 35mm Film einlegen und ganz normal entwickeln lassen. 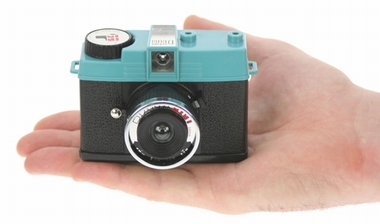 Der Diana Blitz funktioniert auch mit der Diana Mini! Turn the rear door switch  to open and slide the rear door off. Move the pressure plate  down and put the new 35mm film into the left hand side. Pull the film towards the clip on the take up spool  and clip on. Turn the advance wheel  anticlockwise a little to make the film move up to the yellow mark. Slide the rear door back on. You may need to move the rewind lever  left and right a little to make sure it aligns with the film so that the rear door locks properly. Turn the rear door switch  to close and wind the advance wheel  anticlockwise until it stops. Set focus distance. Choose from 0.6m, 1-2m, 2-4m and infinity by turning the lens  clockwise and anticlockwise and matching the marker to the desired focus distance. Set the aperture. Depending on the weather switch the aperture  to either sunny (F/11) or cloudy (F/8). Select shutter mode. Make sure the shutter switch  is set to the correct position. For daytime shots position the switch to 'N'. For long exposures or nighttime shots select 'B'. Choose the frame format. Slide the frame switch  to either rectangular half-frames (72 photos on one roll) or square (36 photos on one roll). If the switch doesn't move don't force it. Take a photo with the lens covered and then you will be able to change frame mode. Now that the focus, aperture, shutter speed and frame mode are all set you're ready to go! Actually, no, wait! Keep the lens cap on and shoot three or four frames first. This way the photo lab will know when the first frame starts. Now you really are ready! When you have finished the film, hold down the rewind button , release the arm from the rewind spool  and turn it in the direction of the arrow until the film is fully rewound (you should hear it unclip from the sprocket gear spool).